The Vívoactive 3 is Garmin's third-generation GPS-capable smartwatch. You can download apps and watch faces from the Connect IQ store, track various fitness activities (running/biking/yoga/etc), see notifications from a connected phone, create custom workouts, and more. It also includes stress tracking, so you can pinpoint the exact moment you realized your keys were at home. The Vívoactive 3 will cost anywhere from $229 to $299, and you can find more info (and links to buy it) here. It's available in Stainless Steel Black, Slate Black, and Stainless Steel White. Next up is the Garmin Vívosport, a more basic fitness tracker. It can read your heart rate, track runs/bikes/walks with GPS, and monitor stress levels. The always-on screen can also show notifications from your phone. The Vívosport does not include Garmin Pay, in case you were wondering. The Vívosport will set you back $199, and comes in three colors - Black Slate, Black Fuchsia, and Black/Lime. You can find more information about the wearable here. 'Hybrid smartwatches' can be hit or miss, but Garmin is taking a shot at them with the Vívomove HR. If you're not familiar with the term, Hybrid smartwatches are usually analog-based mechanical watches with limited smartwatch functionality, like heart rate monitoring or a basic notification light. The Vívomove HR looks like a normal mechanical watch, but can display information like heart rate and notifications on the bottom of the watchface. The execution looks very well done, if the real product ends up being accurate to the renders. The Vívomove HR costs anywhere from $199 to $299, with four models - Black with Silcone band, Rose Gold with Silicone band, Silver with Brown leather band, and Gold with Brown leather band. You can find more information here. Now that both Fitbit and Garmin have NFC-compatible smartwatches, which one are you more interested in (if you care about smartwatches)? Let us know in the comments, or tell us if you plan on buying any of Garmin's new stuff. PURCHASE, N.Y.--(BUSINESS WIRE)--Today Mastercard announced that it is adding payment capabilities to the newly launched Garmin® vívoactive® 3 to provide active customers a watch that frees them from having to carry their phone or wallet around. Mastercard will be enabling fitness enthusiasts to make contactless payments and pay by simply tapping their device at a contactless terminal at nearly 6.6 million merchant locations globally. Garmin users will enter payment information in the Garmin Connect™ Mobile app (available in Apple and Android app stores) by scanning a card or manually entering their information. Mastercard (NYSE: MA), www.mastercard.com, is a technology company in the global payments industry. We operate the world’s fastest payments processing network, connecting consumers, financial institutions, merchants, governments and businesses in more than 210 countries and territories. Mastercard products and solutions make everyday commerce activities – such as shopping, traveling, running a business and managing finances – easier, more secure and more efficient for everyone. Follow us on Twitter @MastercardNews, join the discussion on the Beyond the Transaction Blog and subscribefor the latest news on the Engagement Bureau. Garmin International Inc. is a subsidiary of Garmin Ltd. (Nasdaq: GRMN). Garmin Ltd. is incorporated in Switzerland, and its principal subsidiaries are located in the United States, Taiwan and the United Kingdom. Garmin and vivoactive are registered trademarks and Garmin Connect and Garmin Pay are trademarks of Garmin Ltd. or its subsidiaries. OLATHE, Kan.--(BUSINESS WIRE)--Garmin International, Inc., a unit of Garmin Ltd. (NASDAQ: GRMN), today announced the vívomoveTM HR, a hybrid smartwatch with activity tracking, ElevateTM wrist-based heart rate1, smart notifications and a touchscreen display. 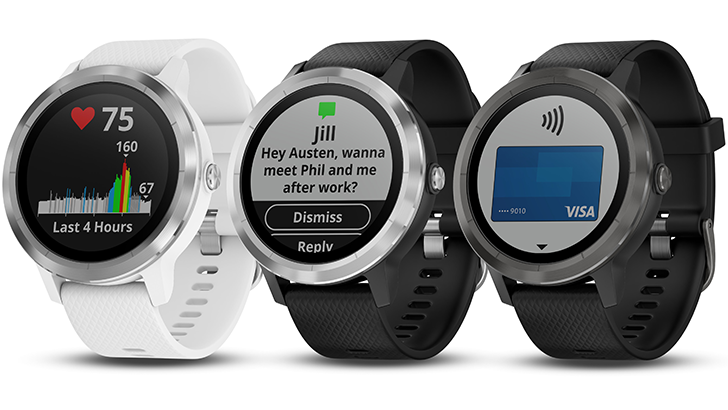 Precision hands show the time and dynamically move out of the way for easy viewing of messages, heart rate and more. A master of subtlety, the smart display only appears when the user turns their wrist. Style-obsessed, rejoice: The vívomove HR combines the latest and greatest Garmin connectivity, fitness and wellness monitoring features with an elegant, classic design. The vívomove HR is one of the many new wearables from Garmin being launched in conjunction with IFA in Berlin, Germany, September 1-6. With its simple yet sophisticated design, the vívomove HR is versatile enough to be worn with jeans, a suit and everything in between and is available in two versions: the sleek vívomove HR Sport and the more upscale vívomove HR Premium with leather straps and full steel body. With leather and silicone strap options and a choice of fashionable case finishes including black, rose gold-tone, stainless steel and gold-tone, the vívomove HR fits a variety of personal styles. It’s swim and shower safe2 and has a battery life3 of up to 5 days in smart mode and up to 2 weeks in watch mode. Stay connected throughout the day with vibration alerts for emails, texts, calls, app alerts, social media updates and more from a compatible smartphone4. Users will also benefit from the ability to control music on their smartphone from the vívomove HR and send an alert to locate a misplaced smartphone. The vívomove HR features helpful fitness monitoring tools including VO2 max and fitness age which provide users with valuable data to monitor changes in their fitness level. Increased activity – like taking the stairs instead of the elevator – will improve these numbers over time. Rough day at the office? The all-day stress tracking feature not only displays current stress levels by measuring HRV (heart rate variability), it also offers a Four-Fold Breath relaxation timer to promote on the spot stress relief. Customers can view a longer timeline of stress levels on Garmin ConnectTM providing them with the opportunity to identify patterns and make lifestyle changes to avoid or better cope with stress-inducing situations. Throughout the day, the vívomove HR automatically syncs with the Garmin Connect mobile app to save stats for easy access later. In Garmin Connect, a free online community, users can see data like workouts, strength training activities, stress levels and sleep patterns displayed on detailed graphs right from a compatible smartphone or desktop computer. Perfect for customers who enjoy a variety of activities, the vívomove comes preloaded with profiles for walking, running, cardio and strength training. And thanks to Garmin Move IQTM, users can set up the device to automatically start and stop a timed walk or run activity. The vívomove HR also counts steps, intensity minutes, sleep, stairs climbed and more, and reminds users when they have been still for too long. The vívomove HR has a suggested retail price of $199.99 for the Sport version and $299.99 for the Premium version. To see what the vívomove HR has to offer, check out this feature benefit video. To learn more, visit Garmin.com/vivo. Garmin International, Inc., is a subsidiary of Garmin Ltd. (Nasdaq: GRMN). Garmin Ltd. is incorporated in Switzerland, and its principal subsidiaries are located in the United States, Taiwan and the United Kingdom. Garmin is a registered trademark and vívomove, Elevate, Move IQ, Connect IQ and Garmin Connect are trademarks of Garmin Ltd. or its subsidiaries. OLATHE, Kan.--(BUSINESS WIRE)--Garmin International, Inc., a unit of Garmin Ltd. (NASDAQ: GRMN), today announced the vívosportTM, the smart activity tracker1 with ElevateTM 24/7 wrist-based heart rate and GPS to accurately track every walk, run and ride. With an always-on Garmin ChromaTM color touchscreen display and new built-in sports apps for everything from strength training to cycling and cardio, the vívosport is optimized for both indoor and outdoor workouts. Smart notifications keep users connected as they jump from one activity to the next, and fitness and wellness monitoring tools provide valuable information like fitness age and stress level. Safe for swimming and showering2 and featuring a battery life3of up to 7 days in smartwatch mode and 8 hours in GPS mode, this ultra-slim tracker is built for life on the go. The vívosport is one of the many new wearables from Garmin being launched in conjunction with IFA in Berlin, Germany, September 1-6. The vívosport features helpful fitness monitoring tools including VO2 max and fitness age which provide users with valuable data to monitor changes in their fitness level. Increased activity – like walking the dog or training for a 10K – will improve these numbers over time. The vívosport also includes all-day stress tracking by measuring users’ HRV (heart rate variability). The ability to view both current stress levels at the wrist and a longer timetable of stress on Garmin ConnectTM allows customers to identify patterns and consider making lifestyle changes to avoid or better cope with stress-inducing situations. A Four-Fold Breath relaxation timer further helps users balance stress and rest. With built-in sports apps for walking, running, biking, cardio and strength training, the vívosport is the perfect accessory for running the neighborhood, conquering a high-intensity interval training (HIIT) class or counting reps and sets in the gym. And thanks to Garmin Move IQTM, the vívosport automatically classifies multiple activities, making it even easier for users to get credit for their workouts. Give loved ones peace of mind during outdoor workouts with LiveTrack4, a feature that tracks activity and location in real time. Designated individuals will receive invitations via email, Facebook or Twitter with a link to a webpage that includes the position of the connected vívosport device. The vívosport is the only fitness band to include this LiveTrack feature. Stay connected on the move with vibration alerts for emails, texts, calls, calendar reminders, app alerts, social media updates and more from a compatible smartphone4. Users will also benefit from the ability to control music on their smartphone from the vívosport, send an alert to locate a misplaced smartphone, and control a Garmin VIRB® camera (sold separately). Throughout the day, the vívosport automatically syncs with the Garmin Connect mobile app to save stats for easy access later. In Garmin Connect, a free online community, users can see their workouts, strength training activities, stress levels and sleep patterns displayed on detailed graphs. View outdoor workouts on detailed maps, compete in weekly challenges and connect with other fitness enthusiasts, right from a compatible smartphone or desktop computer. The ultimate companion for both indoor and outdoor activities, the vívosport features a sunlight-readable always-on, Garmin Chroma color touchscreen display and ultra-slim, sporty band available in black/slate (small/medium and large), black/fuchsia (small/medium only) and black/limelight (large only). The vívosport has a suggested retail price of $199.99. To see what the vívosport has to offer, check out this feature benefit video. For more information, visit Garmin.com/vivo. Garmin International, Inc., is a subsidiary of Garmin Ltd. (Nasdaq: GRMN). Garmin Ltd. is incorporated in Switzerland, and its principal subsidiaries are located in the United States, Taiwan and the United Kingdom. Garmin and VIRB are registered trademarks. vívosport, Chroma, Elevate, Move IQ and Garmin Connect are trademarks of Garmin Ltd. or its subsidiaries. SAN FRANCISCO--(BUSINESS WIRE)--Visa (NYSE:V) today announced it is enabling payments on the new Garmin vívoactive 3 smartwatch, allowing consumers with active lifestyles to pay with the flick of their wrist instead of stashing their cards or cash in their socks while exercising. A recent review of consumers’ workout woes, the “Visa Sweaty Money Survey,” found that for those who do decide to bring forms of payments along with them on workouts, 57 percent admitted to placing it in an unconventional place, like a sock or even their undergarments. The Garmin vívoactive 3 is the first wearable from Garmin to feature Garmin Pay, an early NFC-based product to utilize the Visa Ready for Tokenization program, via TSP* program partner Fit Pay, Inc. The Visa Ready for Tokenization program gives partners access to Visa’s broad network of tools and services – including the Visa Token Service – to speed up and simplify the process for embedding secure payments in connected or mobile devices. 60 percent of those surveyed would be interested in using a wearable device to pay for something during their workout. 49 percent of respondents have wanted to make a payment before or after working out, but couldn’t because they didn’t have a form of payment with them. 57 percent of respondents refrain from carrying any form of payment while exercising because they’re worried about losing it or have no place to put it. Eligible Visa accountholders from participating financial institutions will be able to initiate payments on the run when Garmin Pay becomes available. For more information or to find out how you can work with a Visa Ready-qualified TSP partner, please visit https://visaready.visa.com/. The “Visa Sweaty Money Survey” was conducted among a panel of approximately 1,000 adult users ages 18 and older within the United States by Wakefield on behalf of Visa in August 2017. For a related infographic, go to https://www.visa.com.